I put this up last week when the rain finally stopped, got it up just before the rain started again. I think that may have hurt the sale. Also, it turns out that the market for badminton sets is low in Moncton right now. Text of the ad below in case you can't read the image. I know I can't. Quick! It stopped raining! You've got about an hour before it starts again, but with so many outdoor activities to choose from, how do you decide? Easy! It's time to play badminton! For just $25, you could be having a great time with all your friends that like badminton! Imagine how jealous your neighbours will be when they see how popular you are! Picture the looks of surprise and delight on your family's faces when you pull this out at the next family reunion! And though you'll have me to thank for your new-found celebrity status, all I want is your money. Here are some actual quotes that I made up! "When he asked if I wanted to play some badminton outside, I thought I'd have to bring all my stuff over. But he had everything we needed! Thanks Wilson Pro Tour Badminton Kit!" "I work hard for my money, so when I want to play badminton outside I demand quality and a fair price. The Wilson Pro Tour Badminton Kit has it all!" "If you play badminton outside just once in your life, play it with the Wilson Pro Tour Badminton Kit." "I don't like you. Go away." Three out of four imaginary quotes agree, and that fourth one usually lies all the time anyway. 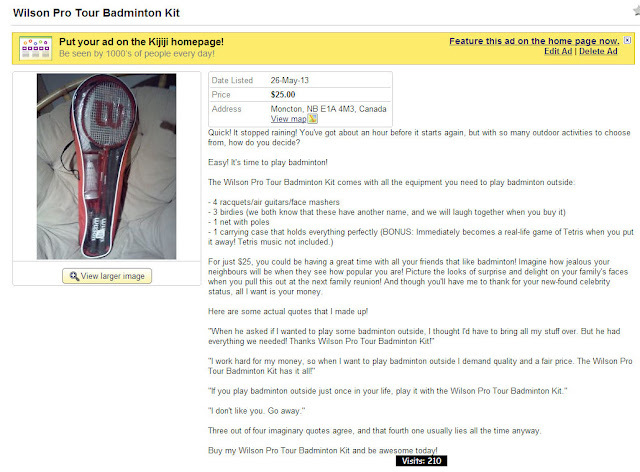 Buy my Wilson Pro Tour Badminton Kit and be awesome today!